Independent sales reps, US Coatings is interested in working with you. Check out our independent sales rep page to learn more and request additional information. Learn more about becoming an independent sales rep.
A coating specification serves many purposes. In its basic use, it provides a roadmap for the proper installation of a coating system. Any number of painting standards are often referenced to provide the applicator or end user proper guidelines for carrying out the specified surface preparation and proper application of the specified coating or coating system. The specification as written already assumes that the coatings specified are suitable for the exposure and will meet the expectations of the owner. Unfortunately; all too often, specifications are poorly written, can cause ambiguities, fail to account for problems that may come up (example: failing to specify cold-cure products during winter painting) and probably the most problematic (to the end customer) specifying the wrong products. Those are doomed to early failure. If the products that are specified are wrong for the application; the rest of the specification is moot. This article will discuss two commonly used types of coating specifications; one that uses “performance-based” requirements and the other simply calls out “specific named products”. The assumption (for this article) is that the specification as written will indeed handle the exposure and will meet the owner’s needs and expectations. A separate article will discuss how to select the right coating system. These specifications do not call our specific products by name, but rather list a series of performance requirements (minimum performance) to which the candidate system must comply. It may call out a more general performance requirement or even reference independent (3rd party) specifications such as SSPC (Society for Protective Coatings) http://www.sspc.org/ or MPI (Master Painters Institute) http://www.paintinfo.com/index.asp or others. Often, each coating (primer, intermediate coat and/or finish) has specific performance requirements listed. Well written specifications call out specific requirements that will satisfy the needs of the project. For example, it may call out a certain corrosion resistance for the primer tested to say ASTM B117 (commonly known as the Salt Fog test). It should spell out the extent of the test (say 500 hours) and then spell out the minimum performance requirement (say no more than 2 mm undercutting at the scribe with no plane blistering or rusting). A poorly written specification will simply say “tested to 500 hours in Salt Fog cabinet” without any performance requirement. Testing without performance requirements is meaningless. Any product can be “tested”. A finish coating may have performance requirements written around weathering resistance (gloss and color retention) or abrasion/scratch resistance. In these cases, certain test standards are referenced and minimum performance requirements are defined. Examples of some of the common tests are depicted in the chart below. Be careful that the performance test used actually matches how the coating will be used. For example it makes little sense to call out a weathering performance on a primer that will be topcoated. Likewise, calling out a Salt Fog test solely on the finish coat makes no sense. The test must match the intended use of the specific coating or coating system. Be careful when interpreting submitted coatings for consideration that are “close” to meeting the specification. There are countless examples of coatings that “miss” meeting the specification because of a too strict interpretation of the requirement. For example: When comparing two finish coats that have abrasion resistant numbers of 115 mg loss versus 125 mg loss and the specification calls out no more than 120 mg loss (more loss is less abrasion resistance), the one with 125 mg loss does not meet the specification. From a practical standpoint these two finishes have essentially the same abrasion resistance and their reported abrasion numbers are certainly within the tolerance of the test method. Yet, a perfectly acceptable coating would be disqualified based on a strict interpretation of the specification. So, a specifier should have a very good working knowledge of performance testing, their meaning, and the significance of reported values when qualifying coatings for use. Shown below is a chart with some commonly used performance-based standards for primers and finishes used for atmospheric exposure. This is by no means a complete list. These referenced methods may change based on end use, such as tank linings, high heat coatings, etc. One of the advantages of specifically named products in a specification is that the specifier (engineer or owner) has already determined that the products listed will satisfy the intent of the specification and the needs of the owner. 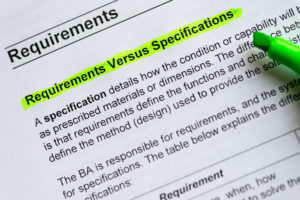 These types of specifications will often list competitive products that may be quite similar to each other (equals) or may in fact be quite different from each other. While the coatings may perform in service similarly, one coating system may have faster dry times or low temperature cure capability that might be favored for a specific set of circumstances. It is then left up to the contractor to choose the system that best fits the application needs. 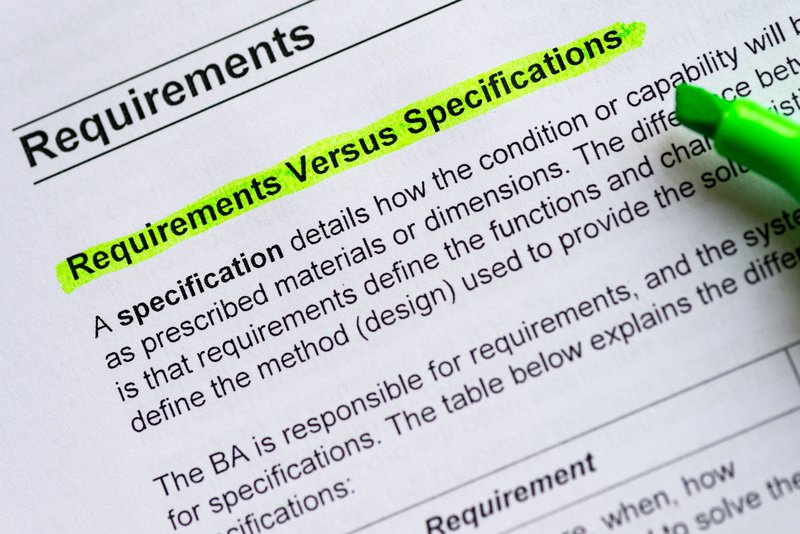 In the end, there are no right or wrong specifications. There are good specs and bad ones and everything in between. The best ones are those that are well written with minimal ambiguities and fulfill the needs of the owner for the anticipated exposure and the owner’s expectations. Contact us about your order. We can provide product recommendations, estimates for custom coating development and more. Need to select a protective coating for your asset, but not sure where to begin? Download this guide to simplify the coatings selection process. We offer on-site analysis consultations with a coatings professional to evaluate your asset and make site-specific recommendations. Interested in viewing our full product catalog? Download a PDF version here and browse it at your own speed.